Award-winning author P.J. Piccirillo is no stranger to the land and history of Pennsylvania. As a native of the state, he has taken his expertise and experiences and crafted an inspiring debut novel of two men in a small logging town in the Alleghany Plateau. 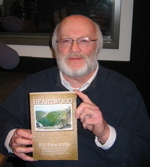 Heartwood follows John Blesh and Tobias Meier as they each try to find their way through life, and reflects the impact that the land and Pennsylvania culture has on them during their journey.